It is cold in Minnesota in the winter... I mean bone chilling cold. We have below zero temps for days at a time. The worst day this year was a high of -9 degrees F with a windchill of -20... Yicks that is stay home bundled under a blanket weather! And I love to be warm. I hate to be cold. Why do I live here??? Good question! 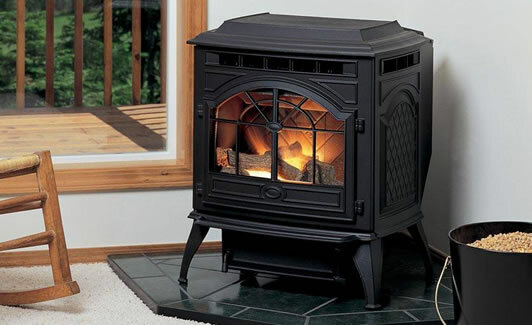 QuadraFire Pellet Stoves are a great way to stay warm on those cold days! QuadraFire Pellet Stoves are free standing stoves that burn pellets (little pieces of renewable, carbon-free material) to keep your house warm all winter long. It is a great alternative to using fossil fuels. On top of all the great benefits to your wallet and the environment you can also get a tax credit of up to $300 with a purchase of a Pellet Stove in 2013! That make me and my account hubby happy! The nice people at Quadra-Fire are also giving away a journal/notebook and a t-shirt to one F&J reader. Just leave a comment telling me why you would love a Quadra-Fire Stove.